Sugar: Sweet Poison or Natural Treat? With all the media coverage recently on sugar and Sarah Wilson's interview on 60 Minutes, I thought it would be apt to raise some questions: Is sugar really that bad for you? What does it actually do in the body? Why do I crave it? What alternatives can I use that are healthy? But I love my sweet treats, so how do I get rid of these cravings??! I think it's really important not to demonize sugar. Sugar is a natural part of our food chain and our taste buds but the difference comes down to quantity and quality. In today's epidemic of obesity and diabetes, we do need to re-evaluate the way we eat and what we eat. Sugar is extremely addicitive (some equate it to heroin!). I have little sugar in my diet nowadays but like everyone, I fall off the bandwagon too occasionally and it's usually because I'm overtired, been pushing it too hard or feeling emotionally depleted and down. Many women think they can eat sweets and not put on weight if it doesn't contain any fat. This is a huge misconception as excess sugar that is not burnt off will be converted and stored as fat. Causes inflammatory reactions in the body which is a precursor to cardiovascular disease, arthritis and auto-immune diseases. Men who drink 1 sweetened beverage a day are 20% more likely to die of a heart attack: American Heart Association Feb 2012. Leaches nutrients and minerals out of the body, leading to insulin signalling problems, depression, fatigue, hyperactivity, eating disorders, mental fatigue, memory problems and increased risk of osteoporosis later in life. Teenagers playing sport and drinking soft drinks have 7 times higher rate of bone fractures! Sugar never makes you feel full, as opposed to fat, so if you have a little, you will continue to want more. You crave sugar if your diet is nutritionally lacking in minerals, especially chromium and magnesium, needed to control your blood sugar and insulin levels. If you have used up all your nutrients through stress, exercise or a lack of sleep, you will also start to crave it as a quick fix to keep you going but this depletes the body in the long term. 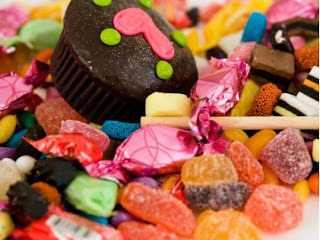 Most people also crave sugar to satisfy an unfulfilled emotional need or to suppress their feelings. We have been trained by media and society that it is easier to turn to a tub of ice cream than ask our partner, friends, family or a qualified therapist for emotional support. Are there any healthy alternatives? Fruit is high in fructose, although it does contain lots of wonderful vitamins, minerals and antioxidants so I suggest to limit your fruit intake to 3 medium-sized pieces a day (size of your fist). Make fruit-based desserts or milkshakes/smoothies and use fruit as a snack. Stevia is a natural sweetener extracted from the leaves of the South American Stevia rebaudiana plant. It contains no calories so will not upset your blood sugar levels or rot your teeth. It is 300 times sweeter than sugar and depending on the quality of the product, there can be a slight bitter after-taste which can take getting used to. It is sold in granule, liquid and tablet form and being heat stable, can be used in baking cakes and biscuits. It is more expensive than sugar but being sweeter, less is needed. Raw honey contains anti-bacterial qualities and some antioxidants with health benefits that have been revered through the ages. I hate to admit it but an old habit of mine was to drop walnuts into the honey jar and scoop them out - raw honey and walnuts, healthy right? Not quite. Honey has a very high glycaemic index because it has a high glucose content so a limit of 1 tsp/day is recommended, for naturopaths too! Heat-treated honey such as the commercial brands of Capillano and Allowrie do not have the health benefits and are just pure sugar so avoid. Maple syrup comes from the sap of maple trees and as such has some antioxidant and mineral content, making it slightly lower glycaemic than sugar. Unfortunately Golden syrup does not have the same health benefits as it is a refined by-product of sugar manufacture. Blackstrap molasses is very nutrient and iron rich by-product of sugar manufacture and as such has a lower glycaemic index with a strong taste. Great for those who are anaemic! Rapadura is a traditional unrefined whole cane sugar before the molasses and sugar crystals are separated so it is a dark brown colour and still contains many nutrients. It is excellent for baking and can be bought from health food stores or Asian stores. Don't be fooled by brown sugar which has still been refined and then up to 10% molasses added back into it to give it its brown colour. This is not enough to give it much health benefits. Chocolate. If you crave chocolate a lot, it means your body may be lacking in magnesium which helps the muscles relax. For a special treat, choose a good quality, dark chocolate which will have less sugar and more antioxidants and hopefully, better quality fat as well! Eat less of more expensive quality chocolate rather than a cheap commercial chocolate everyday. Be aware it does contain caffeine so eating dark chocolate at night can keep you awake. How do I break my Sugar Addiction? Eating protein in every meal helps control your blood sugar levels and reduce cravings so make sure you include some fish, eggs, meat, chicken, beans or dairy in each meal. Eat more dark green leafy vegetables and salads which contain minerals to stabilize blood sugars. Add cinnamon to any desserts, cereals, smoothies or treats which reduces insulin spikes. Eat more fibre which fills you up and some good quality oils as fat makes you feel full. Every time you crave a sugar, drink a glass of water instead - you'll hydrate your glowing skin at the same time! Look at why you crave sugar. Do you need to improve your diet? Are you lacking in vitamins and minerals? Are you running away from your emotions? Do you need to get more sleep? Do you need to put some relaxation into your daily schedule? Are you working too hard or pushing your body too much? Do you need more emotional support? Are you suppressing something you'd rather not face? Breaking the habit takes about 3 weeks for most people so hang in there! Then it is more about the 90/10 rule - 90% of the food to nourish the body and 10% for the soul. We are all human so as I say to clients, of course you can have a sweet treat but it's once a week and not an all-out binge. Once you've broken the habit, you'll be amazed at how much more balanced, energetic and positive you feel both physically and emotionally. Life will take on a new sweetness!